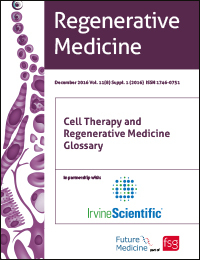 The Future Science Group editorial team is delighted to bring you the third edition of the Regenerative Medicine Glossary, which we hope will be regarded as an essential resource for everyone who works in regenerative medicine. This latest edition includes over 35 additional terms, and the addition of exclusive editorials on current topics in regenerative medicine, written by the members of our expert panel. Do you agree with these terms? Are there any that you think we should add? Comment below! Technical hitch I'm afraid Maurizio – being fixed as we speak. If you check in a few minutes or so and find it's still a problem, let us know. Please accept our sincerest apologies! Thanks Alexandra. It's a guide. We're glad you've found it useful, Victor!